Call for applications for Chinese Scholarship 2019 for KP & FATA Students (BS/MS/PhD). 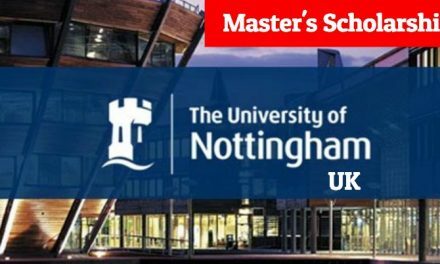 The Chief Minster Scholarship offers Bachelors, Masters and Doctoral (PhD) in high repute universities in People’s Republic of China. 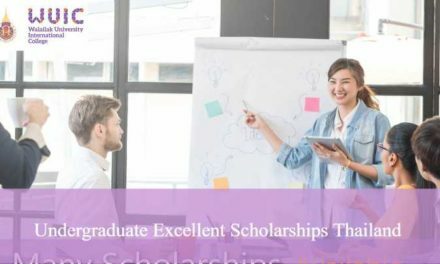 The FEF China Scholarship 2019 is also offering scholarships to study Chinese as a Foreign Language 6 months or 1 year certificate course. The Degre level china scholarships for Pakistan Students are offered in the fields of Engineering, Information technology, Telecom, Networking, Mathematics, Physics, Biology, Biotechnology, Bioinformatics, Microbiology, Statistics, operational research, Management Sciences, Economics, Politics, Psychology, & International Relations. 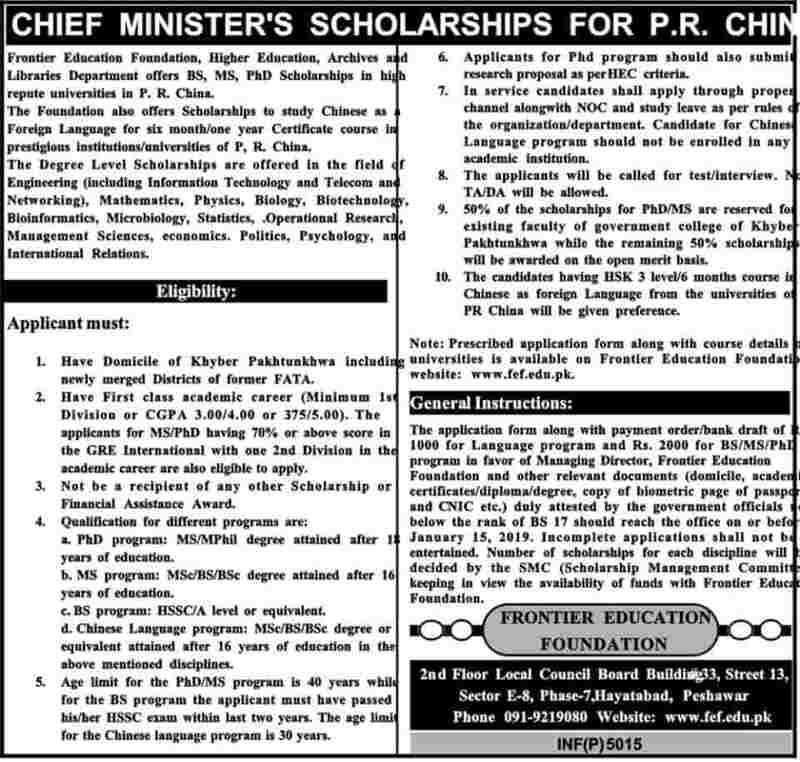 The Chief Minster China Scholarships 2019 is only for the resident of Khyber Pakhtunkhwa and FATA students. Frontier Education Foundation (FEF) was established as a Corporate Body in 1992 under an Act of the Provincial Assembly. The principal function of FEF was promotion and development of education in private sector in Khyber-Pakhtoonkhuwa through financial help and other measures. All the administrative and management powers of FEF vest in the Board of Directors. Managing Director is the Chief Executive of FEF. Applicant should not hold any other Scholarship or Financial Assistance Award. Qualifications For BS Program: HSSC or A level. Qualifications For MS Program: MSC, BS, BSc 16 Years Education. Qualifications For Ph.D. Program: MS/MPhil Degree attained after 18 Years Education. Age Limit For Ph.D. & MS: The Age Limit for MS & Ph.D. is 40 Years. Applicant For Ph.D. program also submits a research proposal as er HEC Criteria. The Applicants will be called for Interview. No TA/DA will be given. Candidates or Chinese language program should not be enrolled in any academic institution. 50% of the scholarship are reserved for existing faculty of Government Colleges of Khyber-Pakhtunkhwa & 50% will be awarded on open merit. Note: FEF Scholarship form along with the courses and universities is Available on Frontier Education Website. Click on the APPLY NOW button below to download the China Scholarship Application form. The Application Form along with payment order bank draft of Rs 1000 For Chinese Language program & 2000 For BS/MS/Ph.D. program in Favour of Managing Director, Frontier Education & other relevant documents (Domicile, academic certificates, diploma, degree) & a copy of a biometric page of passport & CNIC etc. The Nubmer of Scholarships for each discipline will be decided by SMC (Scholarshi Management Committee). For more information Please check the FEF scholarship Advertisement is Given below. Application Deadline is extended to 11 Feb, 2019.